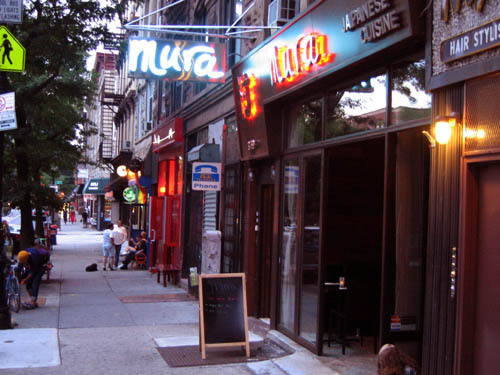 1) The photo above is of Mura, a new Japanese on Fifth Avenue between 5th Street and 6th Street that opened recently. (369 Fifth Avenue, specifically.) It's not so much that it's new, like, within the last 48 hours, so much as we walked by it with our camera. We hear the peanut avocado roll is good if you like that kind of thing. 2) A couple of blocks away there's Jpan Sushi (287 Fifth Avenue between 1st and 2nd Streets), which we mention, not because it's new, but to prove a point that more and more Japanese places are opening in Park Slope. How deep is the sushi marketplace in Park Slope? Stay tuned. These places join a list that includes Blue Ribbon, Nana, Sakura and Ginza, among others.